Riding on our experience in the industry, we, as a Manufacturer and Supplier of Motorized Magnetic Separator, have positioned ourselves in the upper echelons of the industry. Our distribution network allows us to facilitate quick and convenient delivery in a matter of time at your doorstep. Its dimensional accuracy and sturdiness makes it an interesting proposition. We offer the supreme quality at economical rates. Motorized Magnetic Separator : Motorized magnetic separator which can used online where percentage of Iron Particles are more.Magnetic Drum Separators are of self-cleaning type and provide continuous removal of ferrous contamination from a wide range of free-flowing bulk and granular materials in high-volume applications. 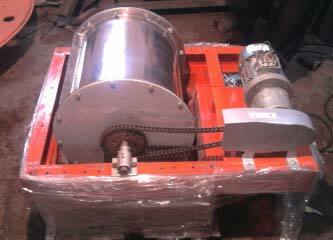 As material reaches the drum, the magnetic field attracts and holds ferrous particles to the drum shell. As the drum revolves, it carries the material through the stationary magnetic field. The nonmagnetic material falls freely from the shell, while ferrous particles are held firmly until they are carried out of the magnetic field by interrupters / cleats. The tramp metal is discharged separately, creating continuous self-cleaning separation. The end result is purified product ready for processing without the worry of costly damage caused by tramp metal.